I created "Rue with a Difference" so that my other Shakespeare painting, "Beware my Sting", could have a companion. This is Ophelia from Hamlet, and the title is from her famous line as she distributes the flowers amongst her friends and family: "There’s fennel for you, and columbines. There’s rue for you, and here’s some for me; we may call it “herb of grace” o’ Sundays. You may wear your rue with a difference. " Rue is a bitter and stinky plant, and in folklore was a symbol of repentance (hence "rue the day"). Ophelia calls it "an herb of grace on Sundays;" because the wearer of rue, when entering a church on Sunday, dipped it in Holy Water, and blessed himself with it, in the hope of obtaining God's "grace" or mercy. "There's rue for you," she says to the Queen, and "here's some for me." The Queen, however, is to wear hers with a difference, that is, in token of repentance, while Ophelia will wear it in regret and grief at the loss of her father and her lover. I'd like to view that line slightly different: that rather than attributing rue with the symbolism of either repentance or regret/grief, Rue is also an herb that promotes sharp vision. Ophelia, depicted here, wears her rue as a way to see her way clearly as someone separate from the role-defining association with either her father or her lover; and if it is used in regret, it is only regret that she came to her end because of the actions of those who were supposed to love and value her. My Ophelia, rather than tragic, has returned from the and she has unfinished business. She is going to "wear her rue with a difference". Pictured in the painting is the brook and willow tree that she met her end in, and she carries a brook trout. 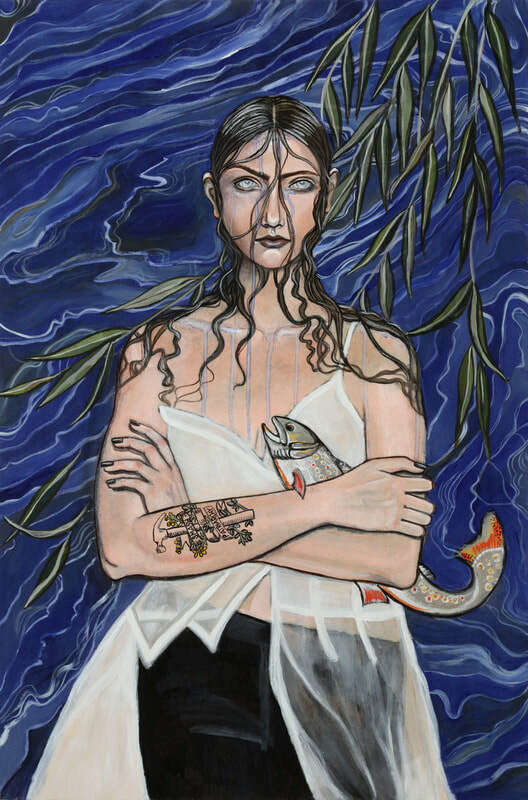 The trout can symbolize moving forward, with conviction and a sense of purpose: which is perfect for this new incarnation of Ophelia.